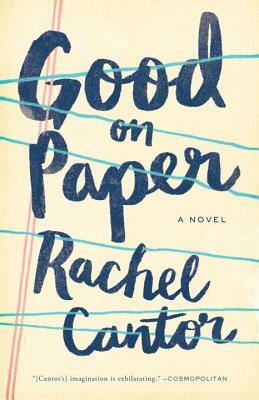 Home » Blogs » info@bookculture.com's blog » Q&A with Rachel Cantor, author of "Good on Paper"
Q&A with Rachel Cantor, author of "Good on Paper"
Rachel Cantor is joining us to talk about her new book, Good on Paper, on Thursday, January 28. After reading some amazing reivews, we're getting a bit impatient for the book's release, so we convinved Cantor to answer some of our more pressing questions ahead of time. Check out her answers below and be sure to come hear her speak at our Columbus location in a couple weeks! 1) How did you come to write Good on Paper? Good on Paper is my second published novel but it’s actually the first book I wrote. It began during an eight-week residency at the MacDowell Colony. I was hoping to write a short piece that would (finally) complete a linked short story collection I was writing about Shira Greene, child expatriate, wandering young adult, and middle-aged single mother/translator/writer. Perhaps because of the time and space afforded me by that residency, the story got longer … and longer … and longer. Eventually I had to concede I was writing a novella; then, disappointed, I realized I was writing a novel. I’m reading Samantha Hunt’s wonderful The Invention of Everything Else, about Nikola Tesla, who lived in the Hotel New Yorker during his later years. I’m obsessed by novels about real people, especially authors and artists but also scientists (e.g., John Banville’s early novels Kepler and Doctor Copernicus) and other innovators. My favorite book of all time is Jane Eyre by Charlotte Brontë. I read it (for the first time) at age ten and it blew open my universe. It has everything—injustice, tragedy, adventure, drama, suspense, romance, voices carried by the wind, unlikely reunions, more than one house fire, disguises, incredible twists, a madwoman in the attic, hard-won redemption, and one of the best child/young woman characters of all time. Stephen O’Connor’s Thomas Jefferson Dreams of Sally Hemings (Viking-Penguin April 2016). He tells me it’s a multiform novel, by which I believe he means he uses a variety of forms (realistic scenes, fantastical scenes, essays, quotations, fragments, dreams) to tell a complex story. He’s long written marvelous short fiction; I’m surprised to learn that this ambitious book will be his debut novel. I can’t wait to read it! Synopsis: Is a new life possible? Because Shira Greene’s life hasn’t quite turned out at planned. Shira is a permanent temp with a few short stories published in minor literary magazines and a PhD on Dante’s Vita Nuova that she abandoned halfway. Her life has some happy certainties, though: she lives with her friend Ahmad, and her daughter, Andi, on the Upper West Side. They’re an unconventional family, but a real one, with Friday night dinner rituals, private jokes, and the shared joys and strains of any other family. So when she gets the call from Romei, the winner of last year’s Nobel Prize and the irascible idol of grad students everywhere, and he tells her he wants her to translate his new book, Shira is happy . . . but stunned. Suddenly, Shira sees a new life beckoning: academic glory, a career as a literary translator, and even love (with a part-time rabbi and owner of the neighborhood indie bookstore). That is, until Romei starts sending her pages of the manuscript and she realizes that something odd is going on: his book may in fact be untranslatable. RACHEL CANTOR was raised in Rome and Connecticut. She is the author of the acclaimed novel A Highly Unlikely Scenario, and her short stories have appeared in The Paris Review, One Story, Ninth Letter, and The Kenyon Review, among other publications. She has received fellowships from Yaddo, the MacDowell Colony, the Millay Colony, the Djerassi Resident Artists Program, and elsewhere, and has been a scholar at the Bread Loaf, Sewanee, and Wesleyan writing conferences. She lives in Brooklyn.